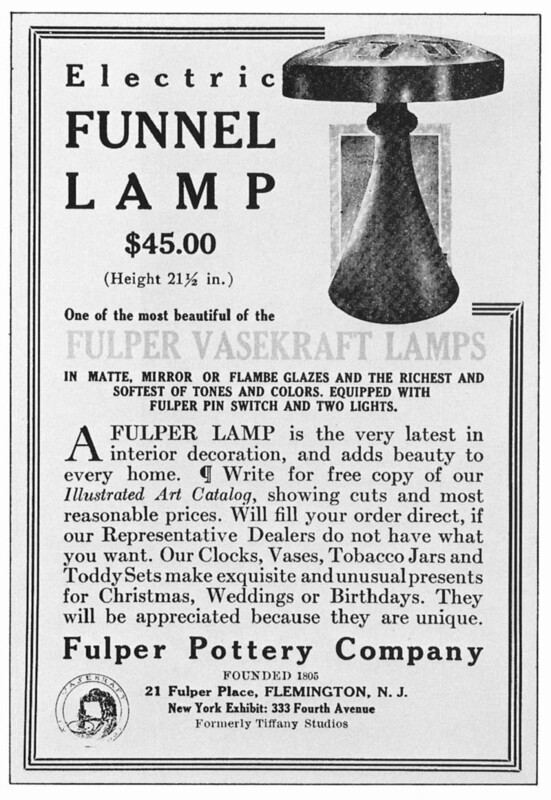 This Fulper Lamp Gallery, two years in the making, features Fulper's distinctive VaseKraft lamps, circa 1911-1918. 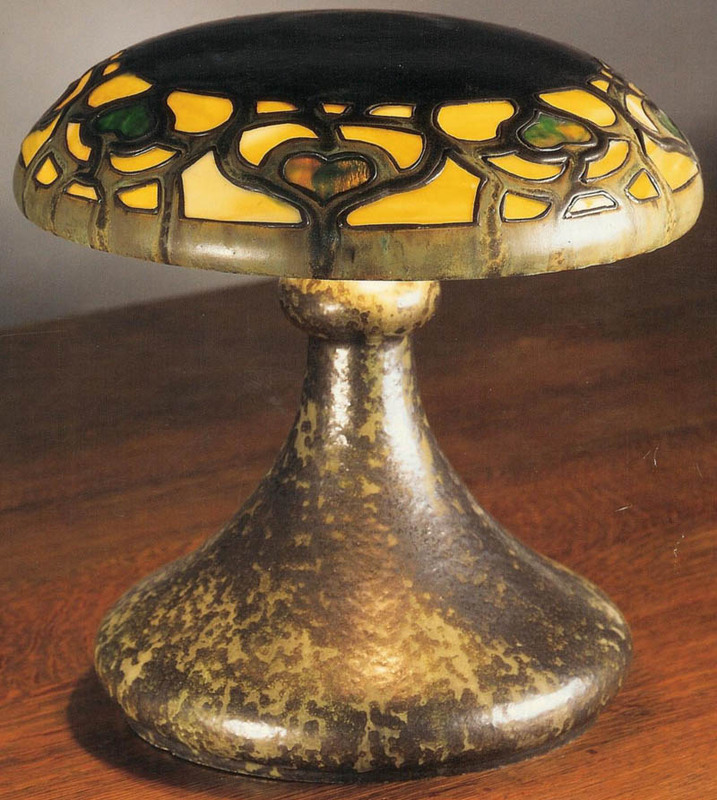 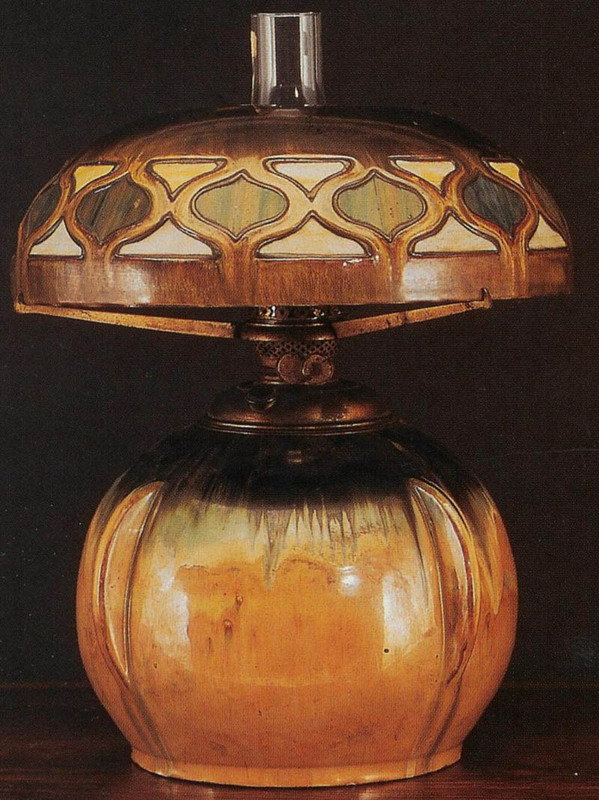 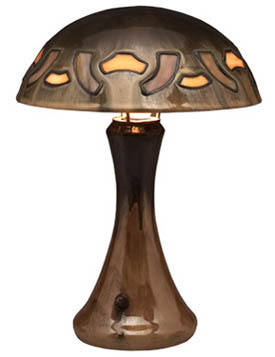 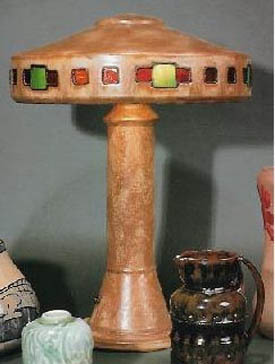 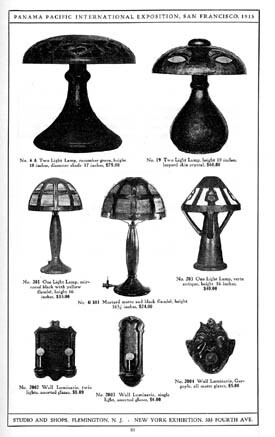 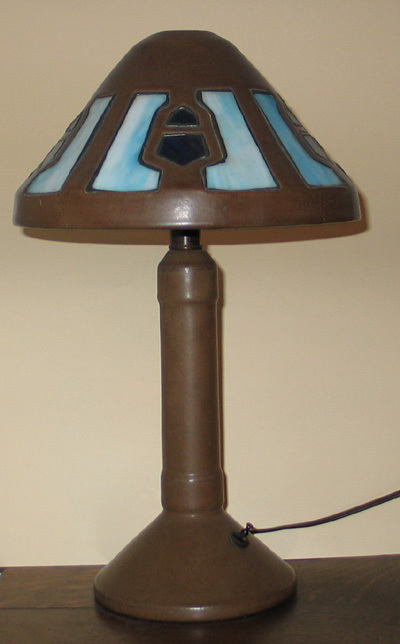 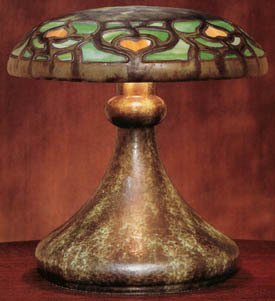 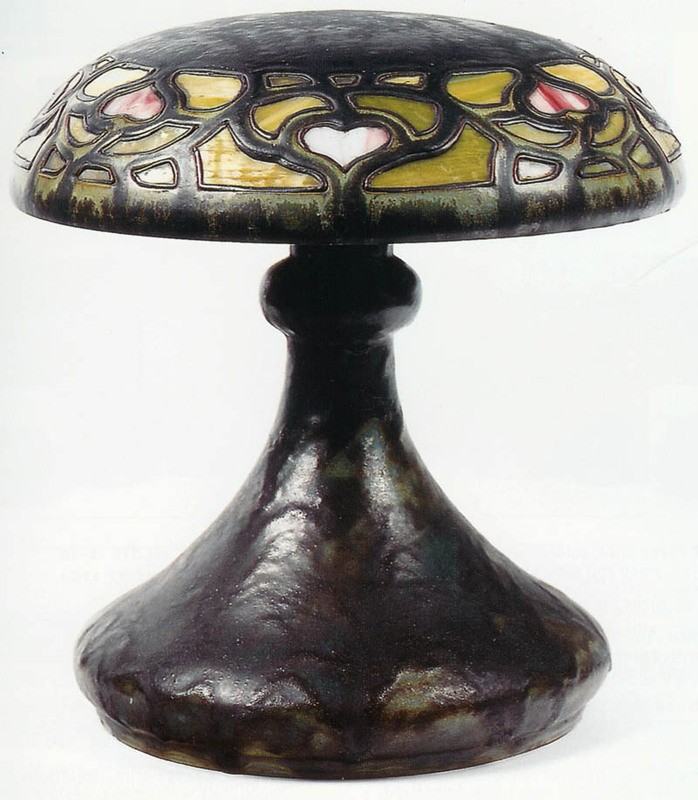 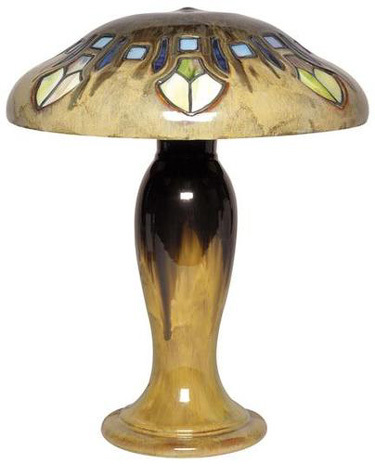 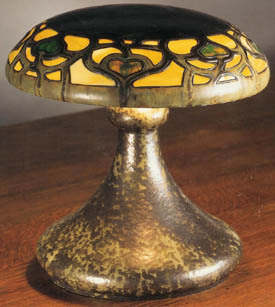 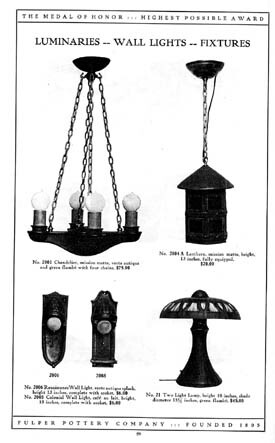 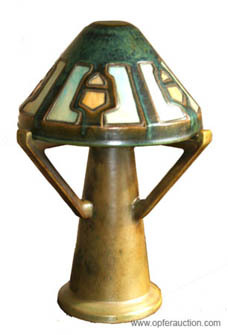 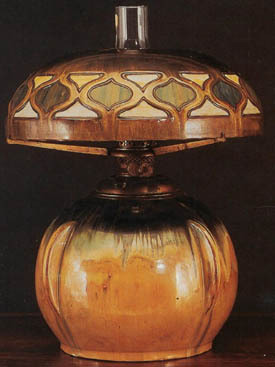 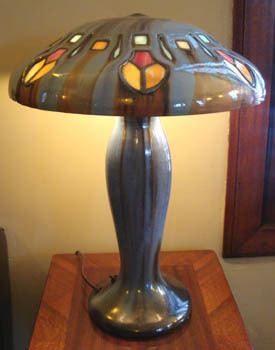 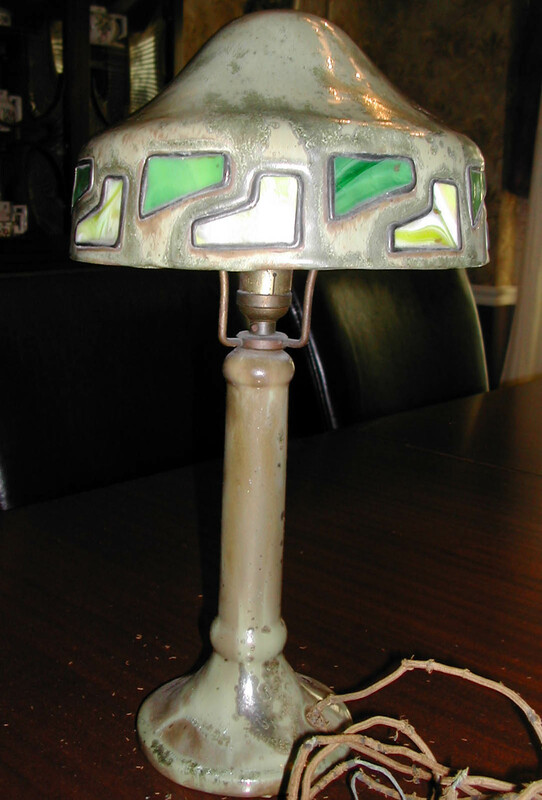 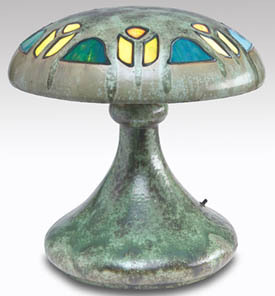 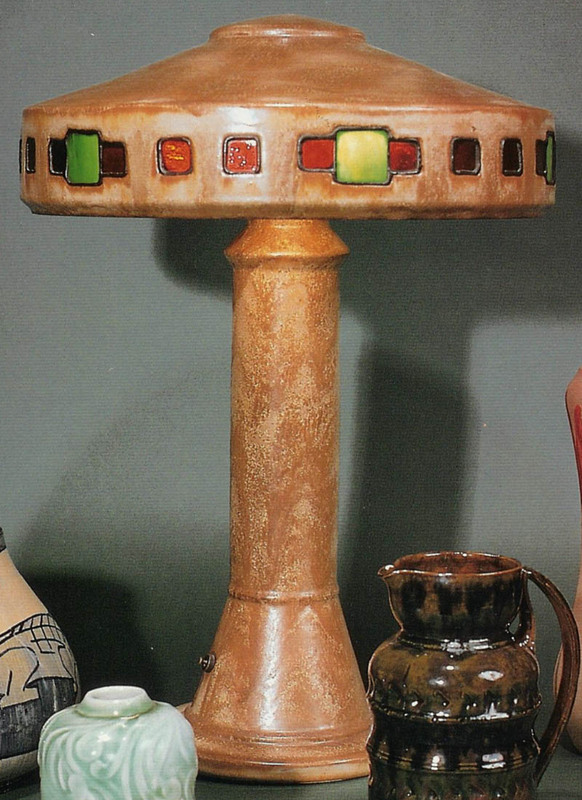 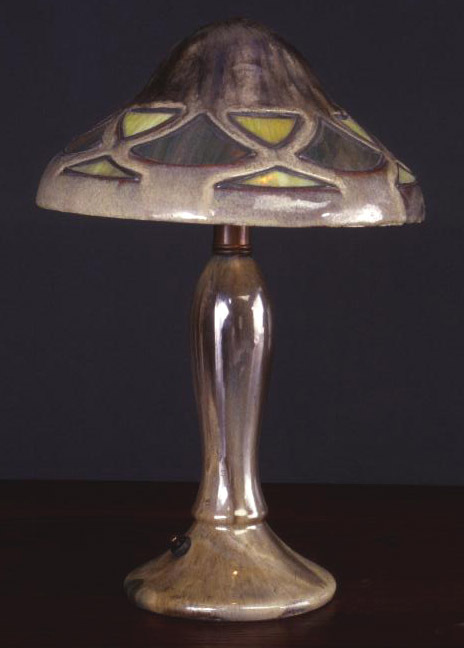 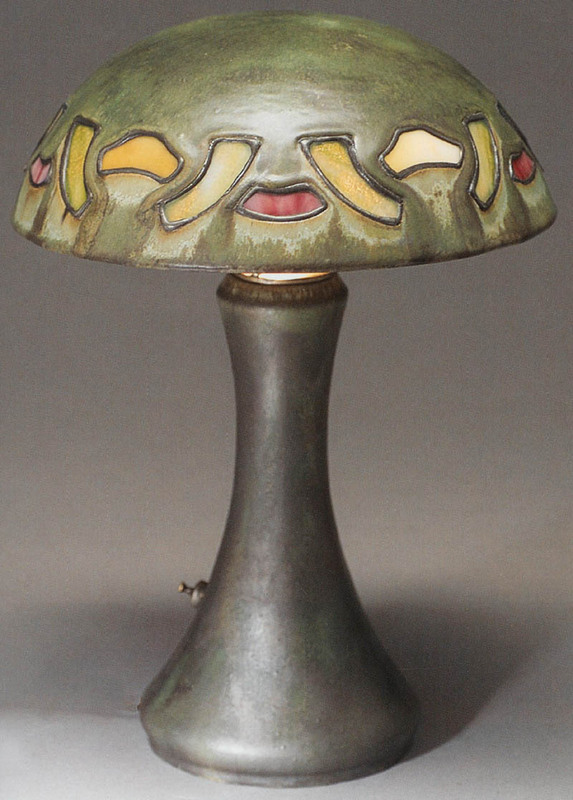 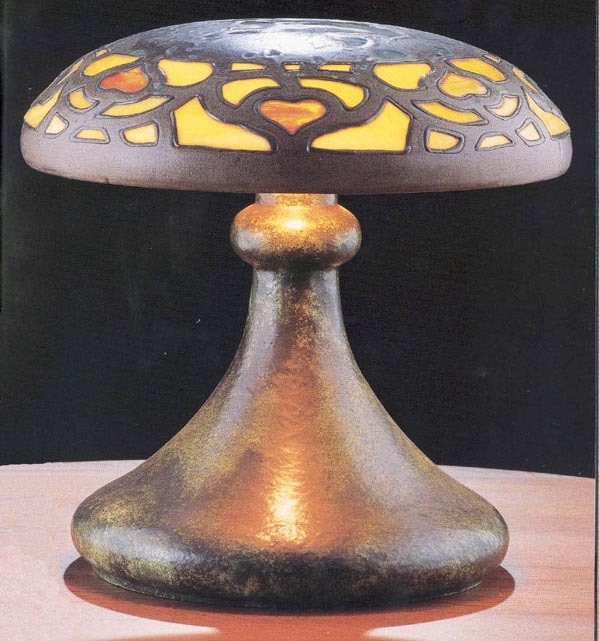 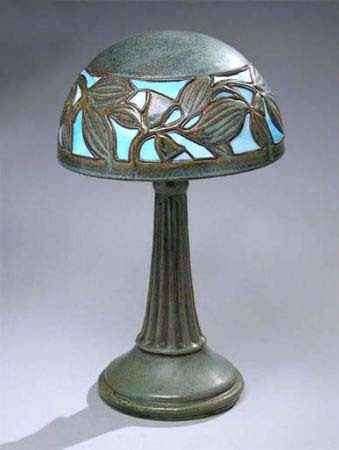 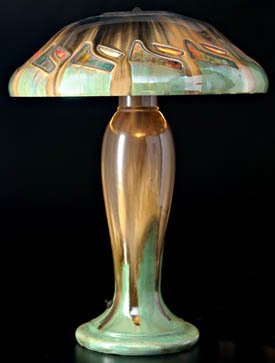 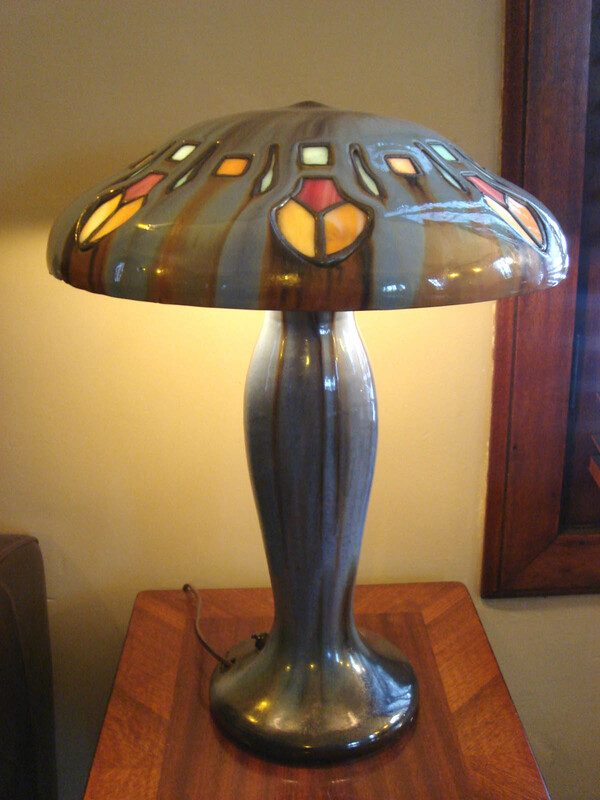 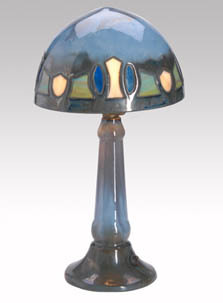 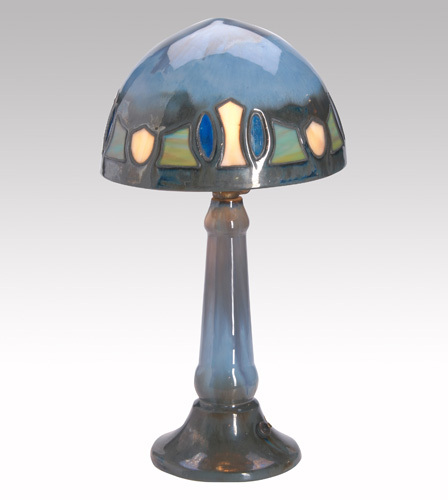 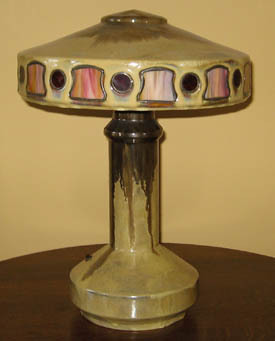 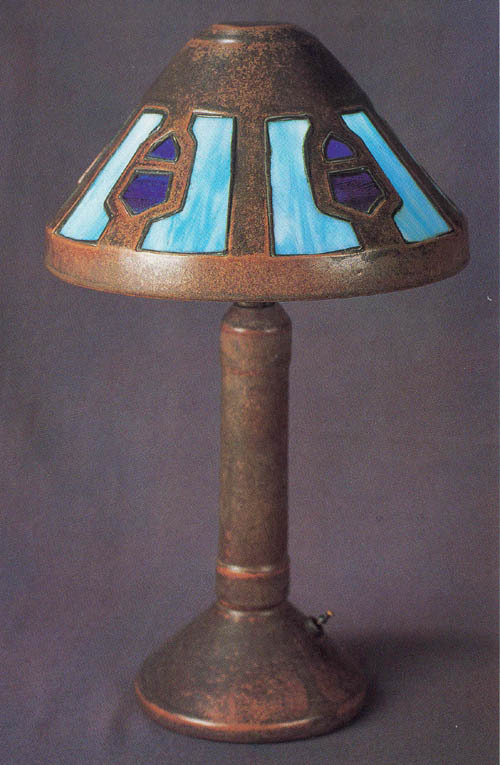 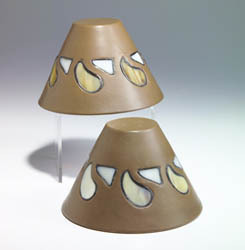 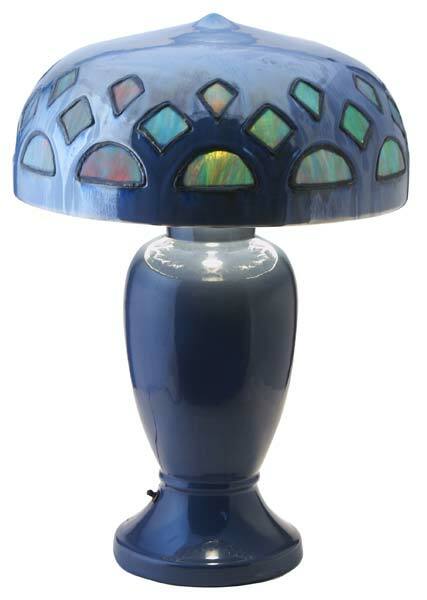 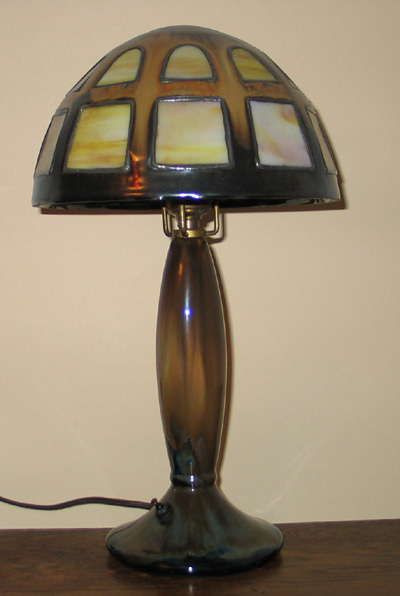 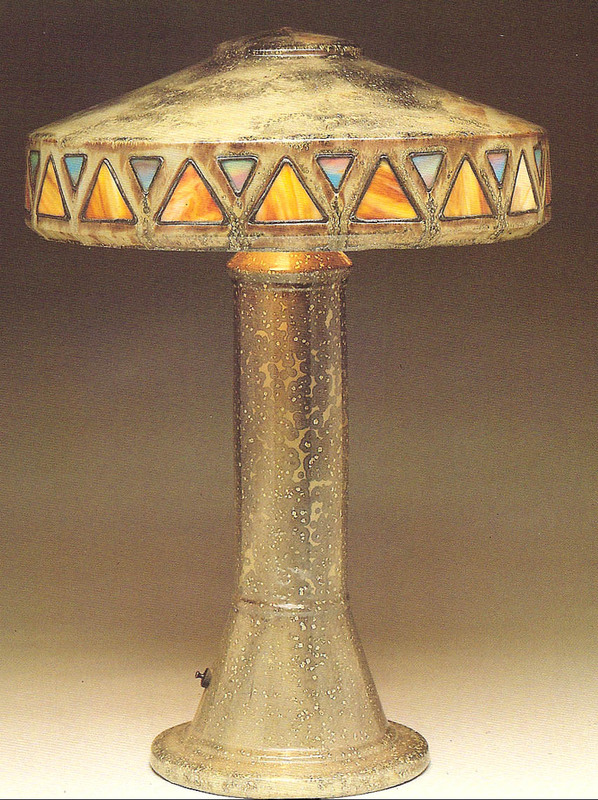 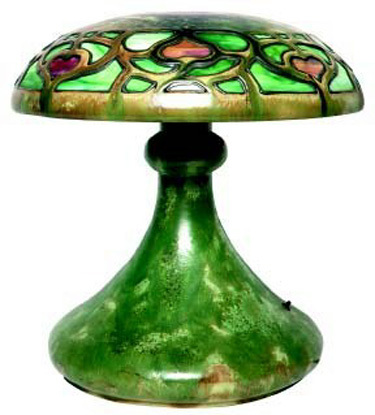 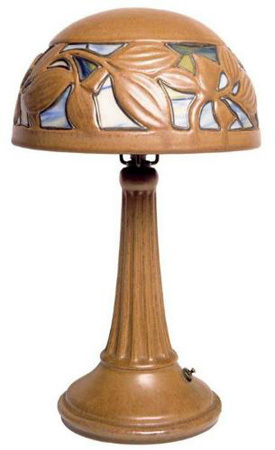 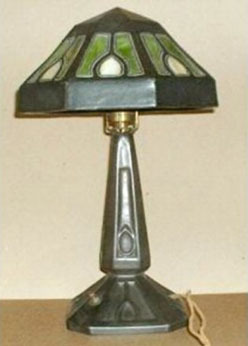 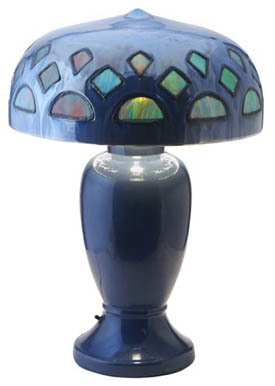 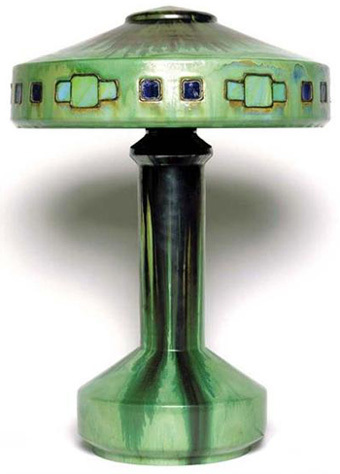 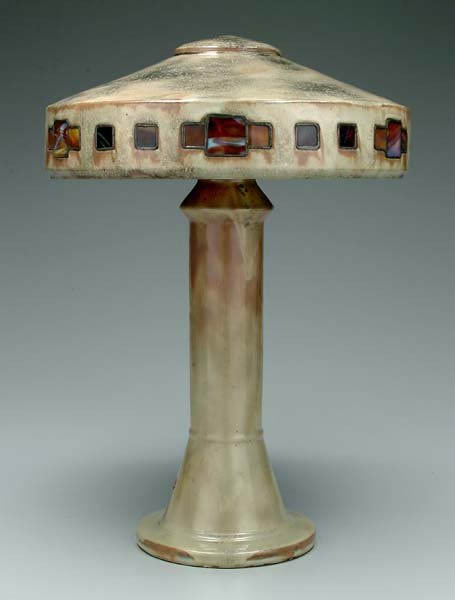 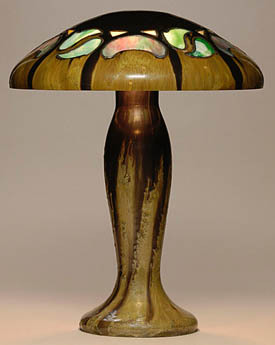 These Arts and Crafts Period lamps are distinguished by their unique ceramic shades that incorporate colorful leaded glass in geometric patterns. 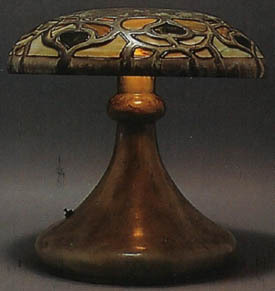 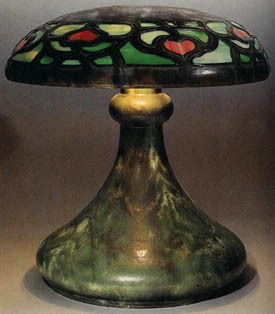 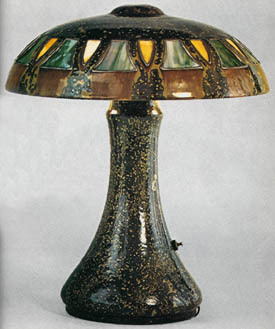 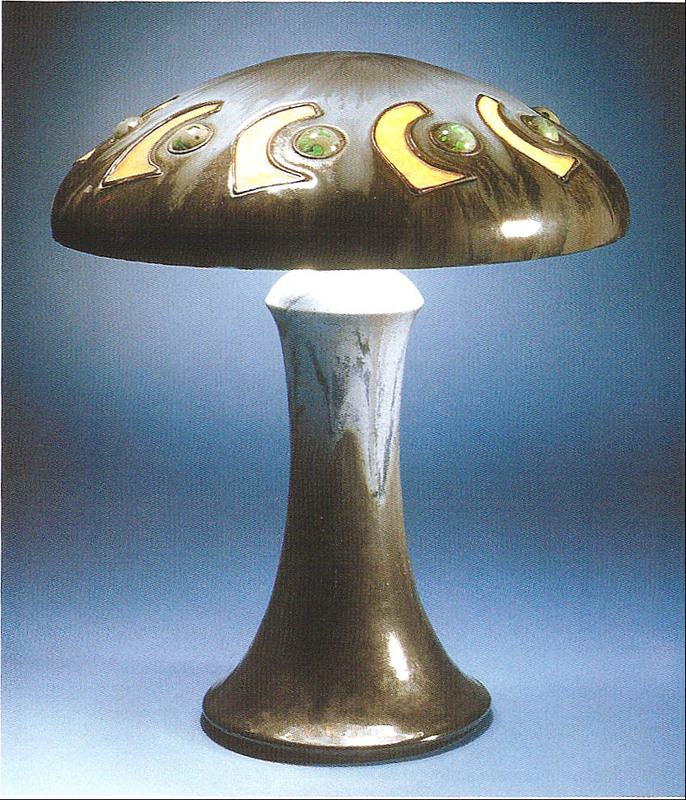 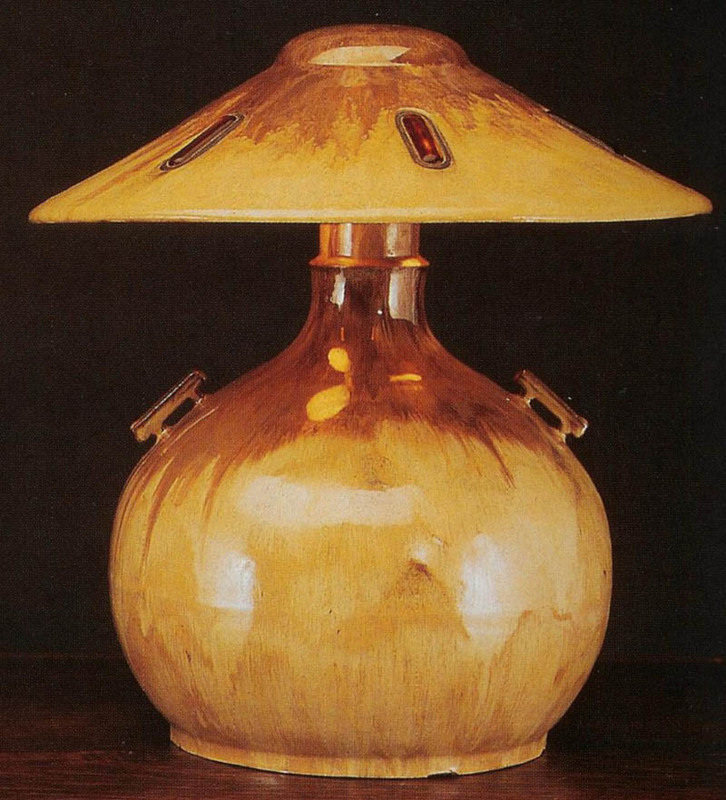 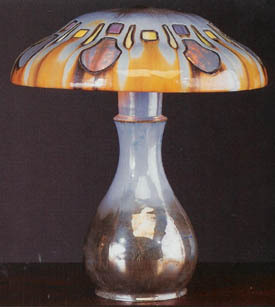 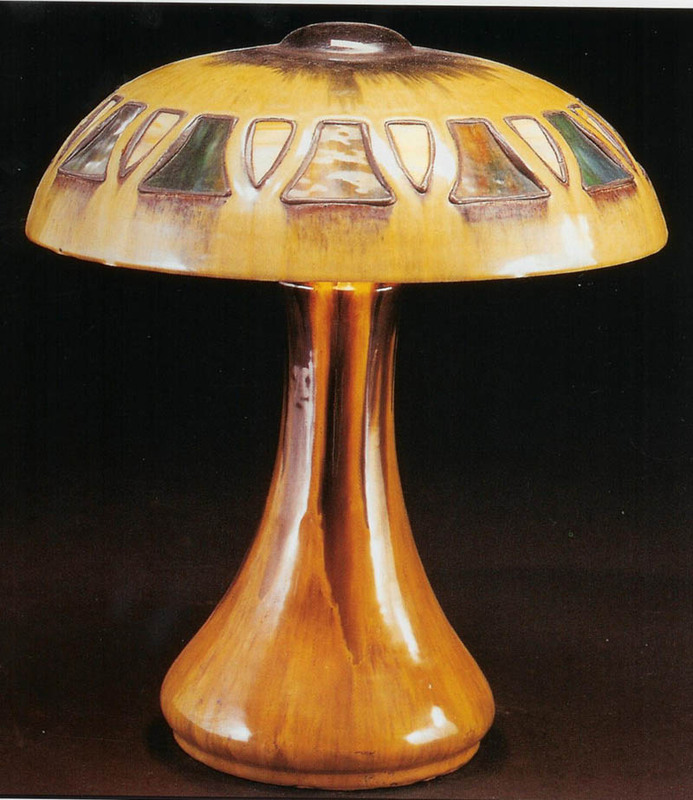 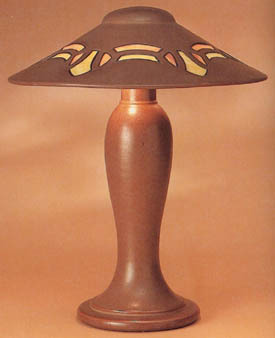 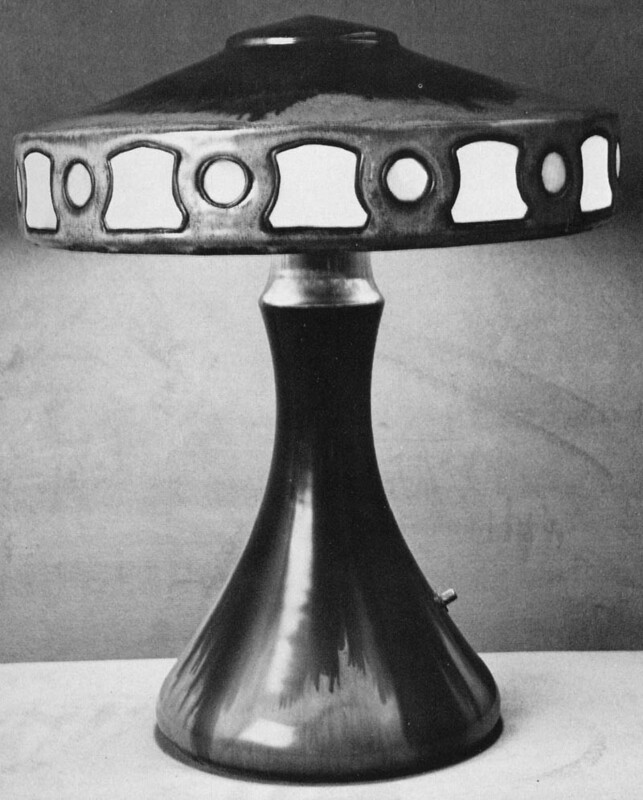 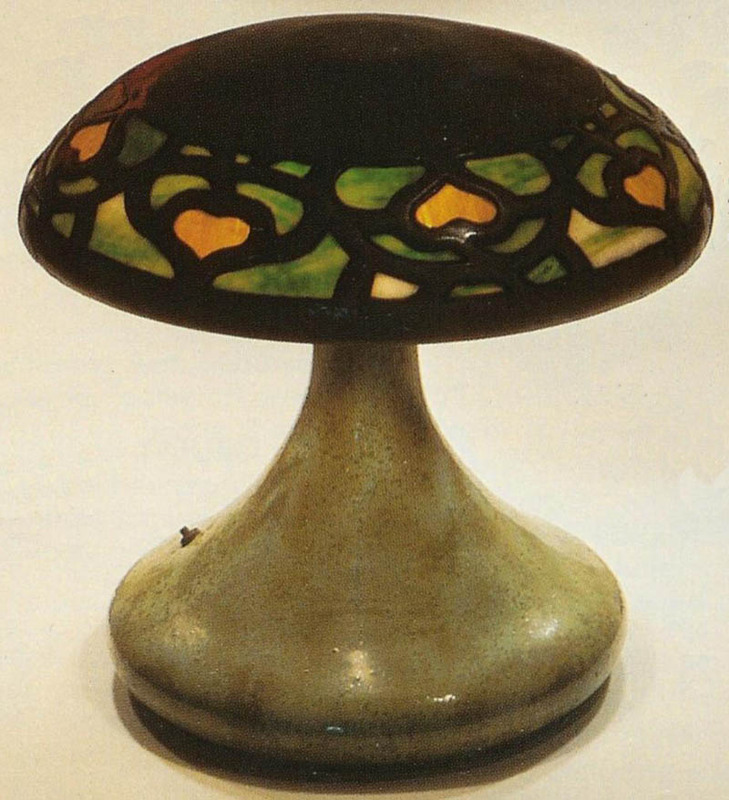 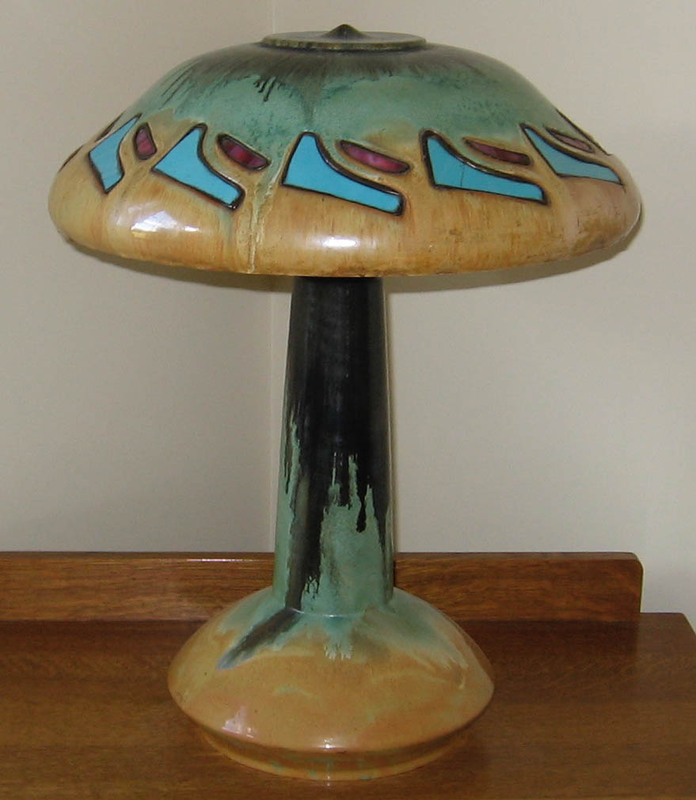 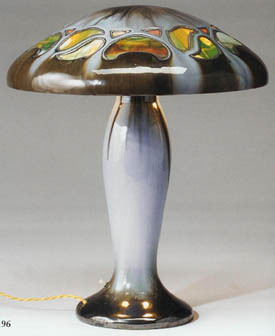 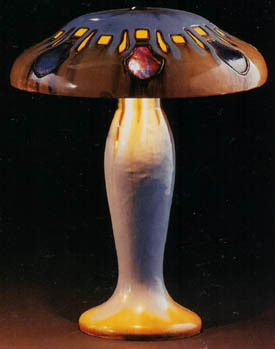 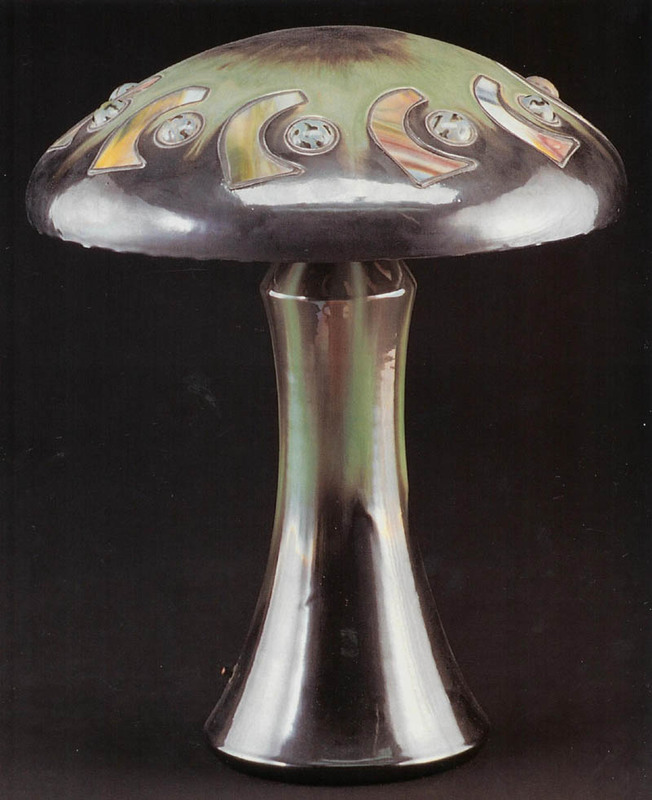 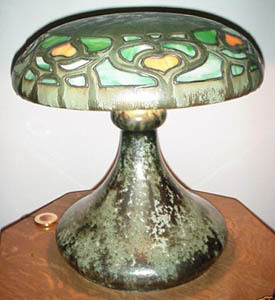 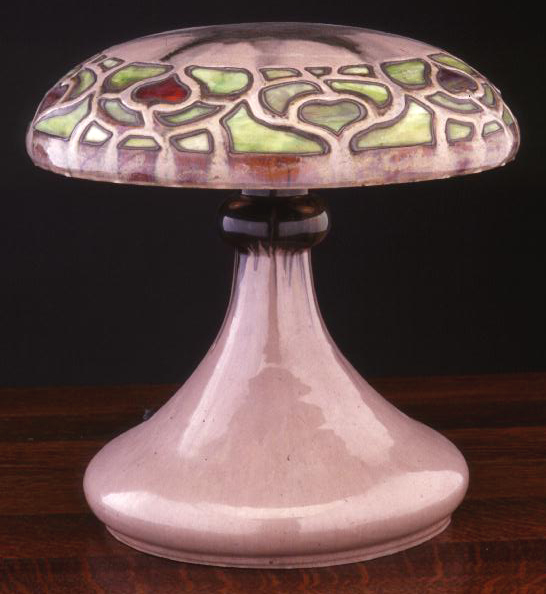 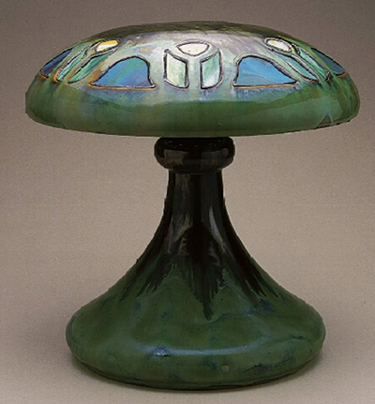 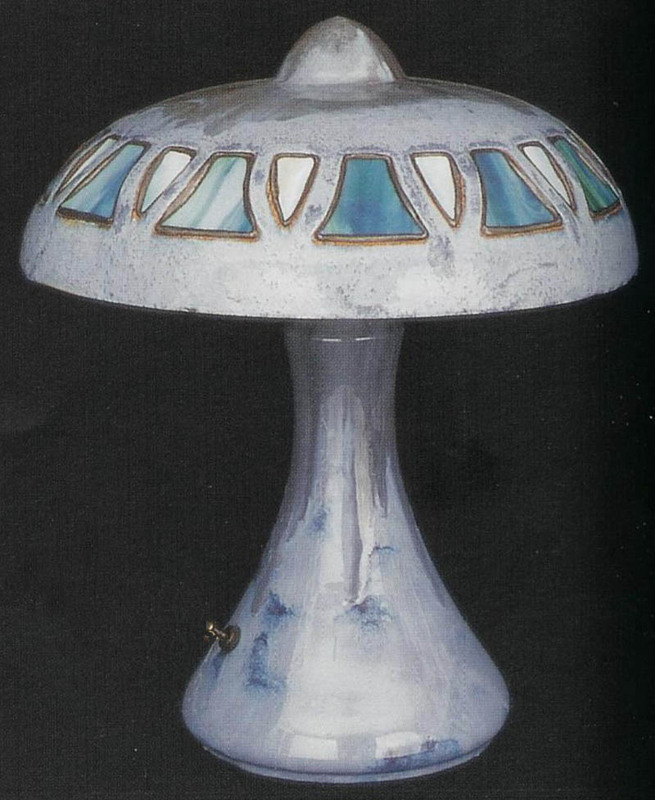 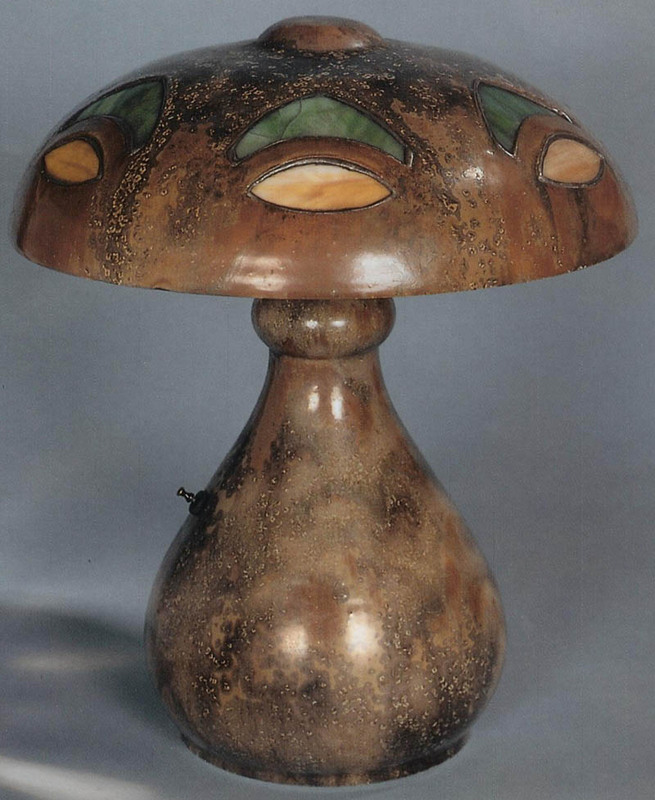 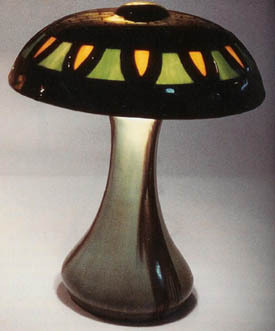 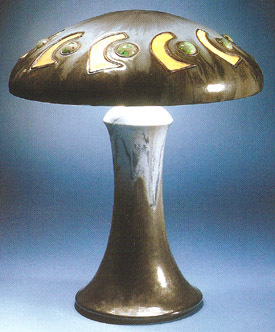 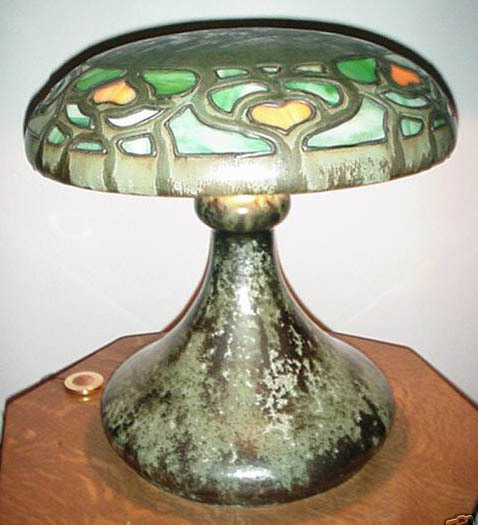 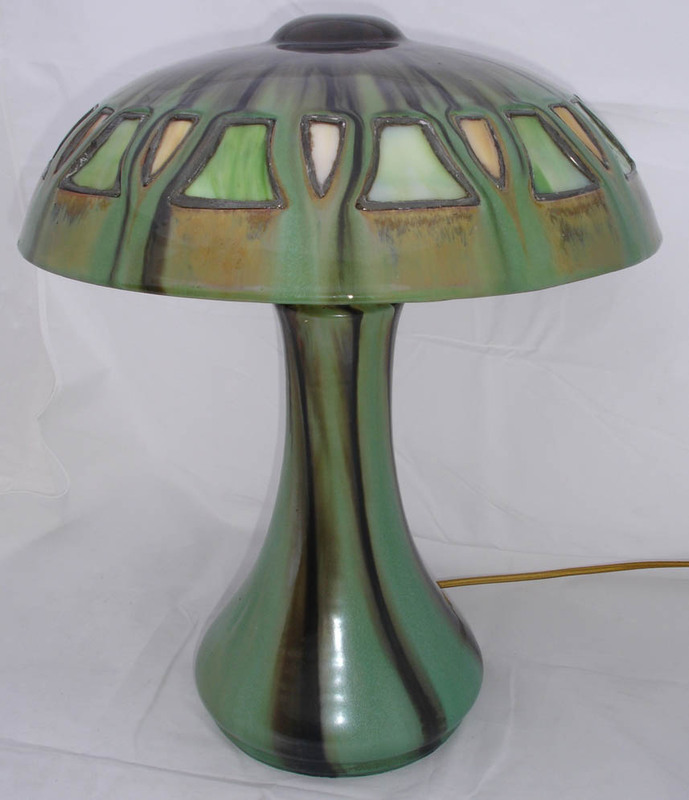 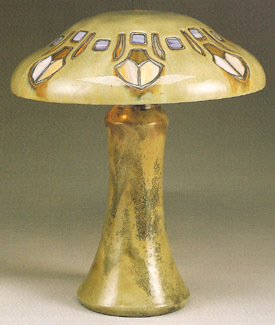 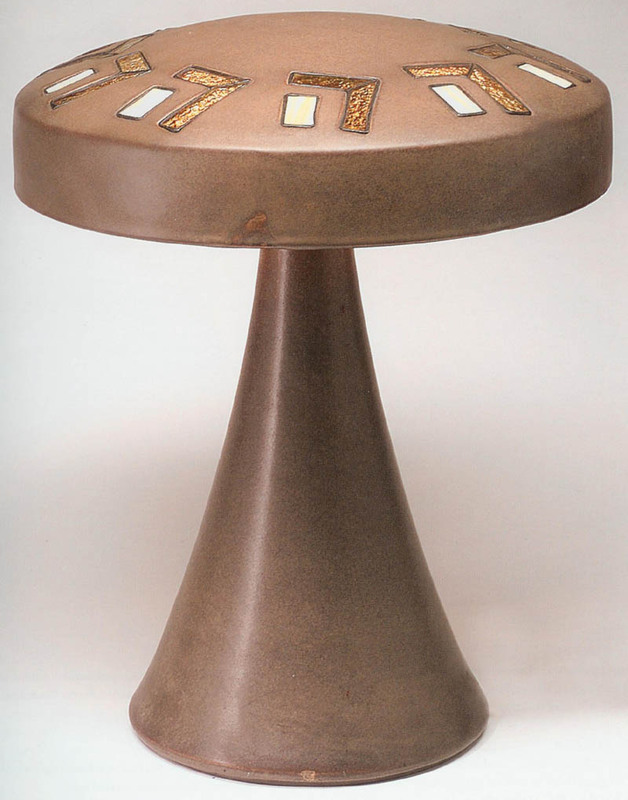 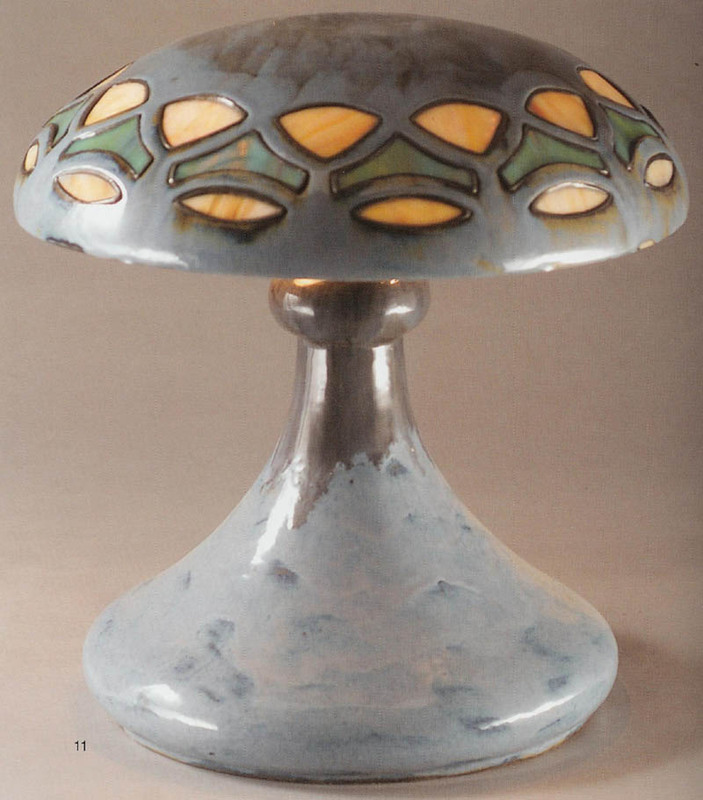 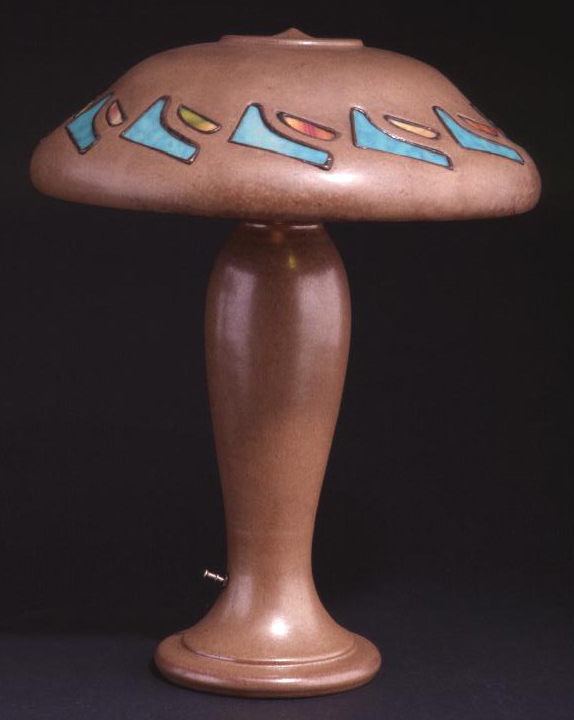 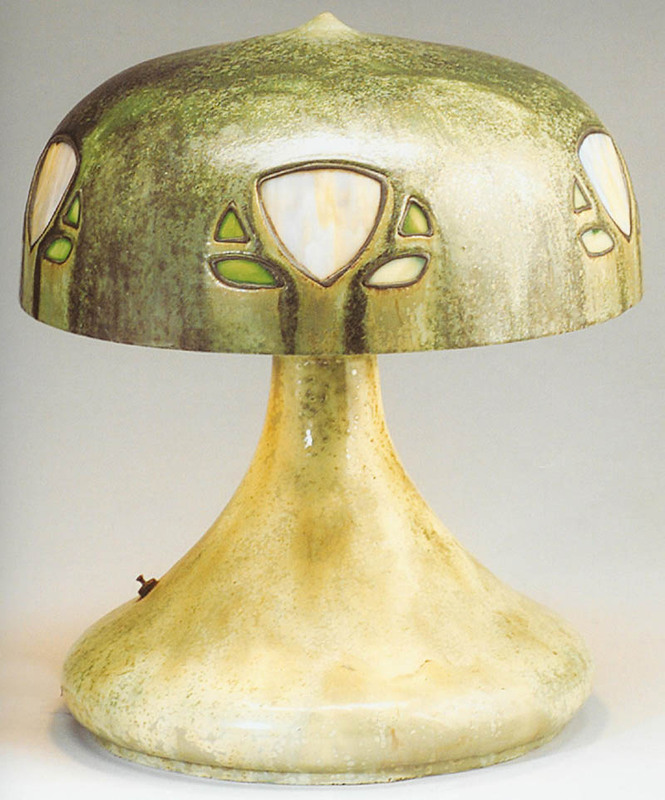 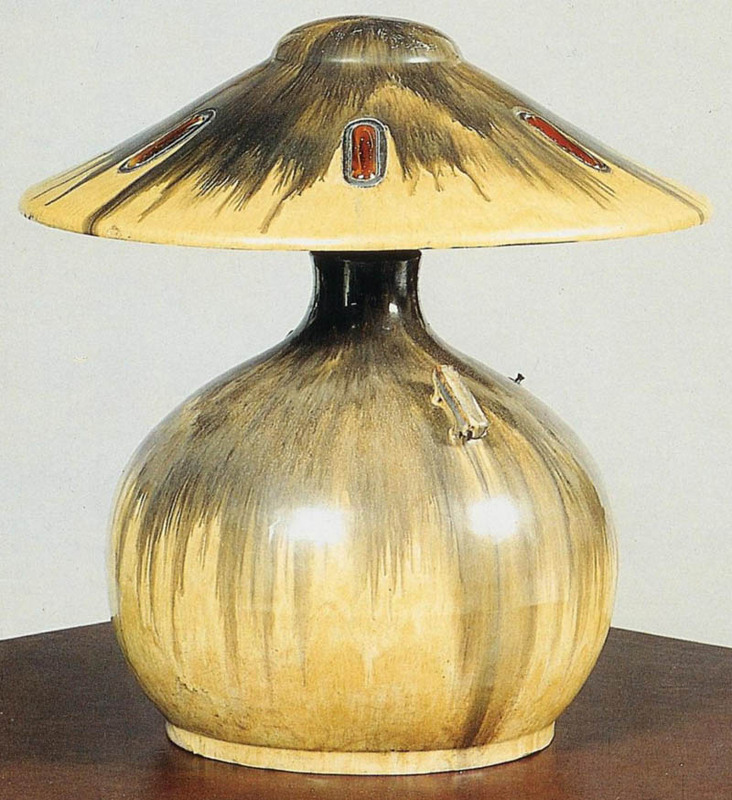 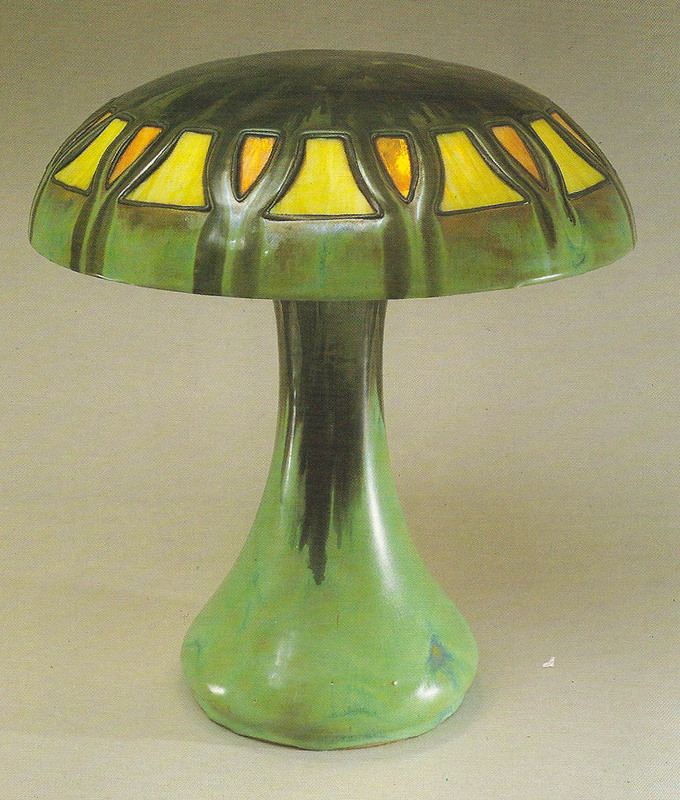 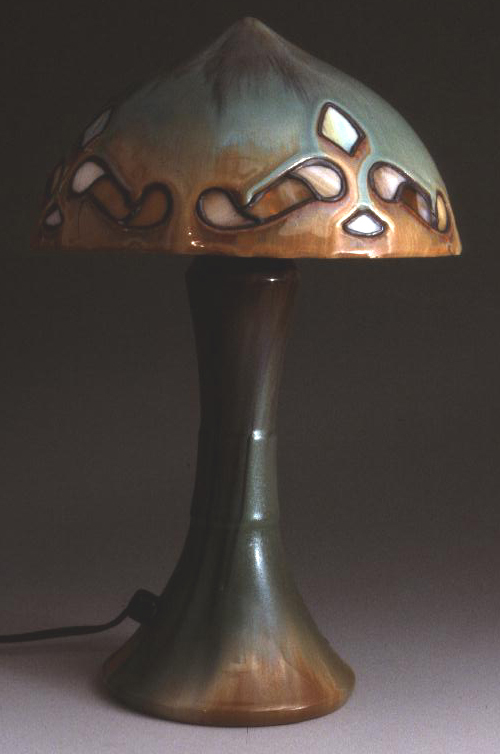 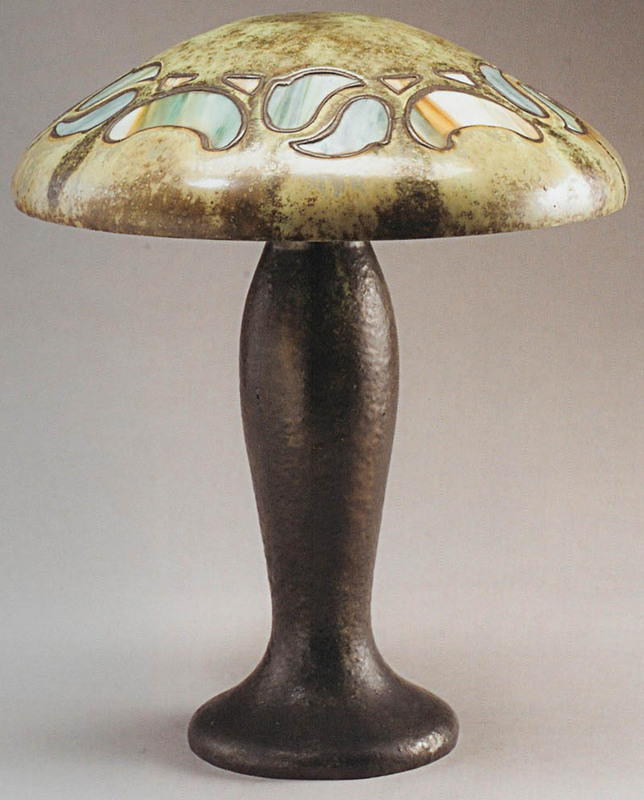 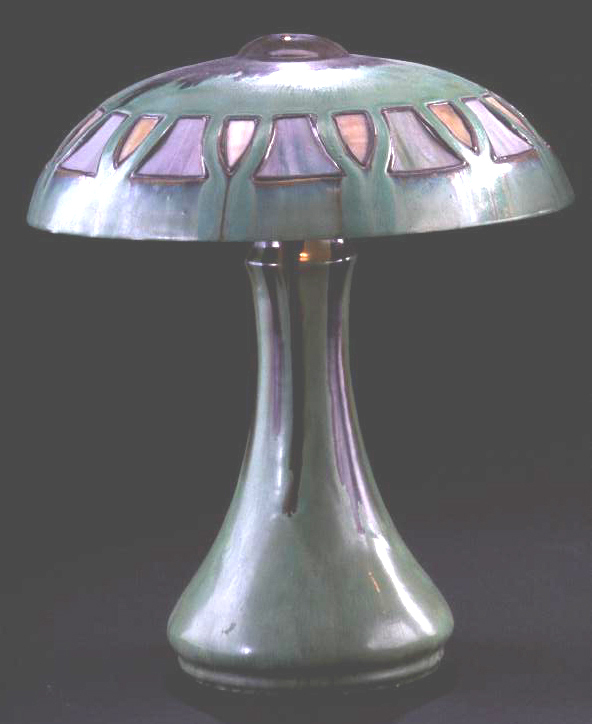 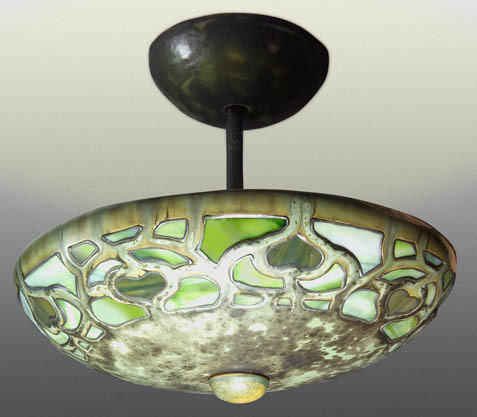 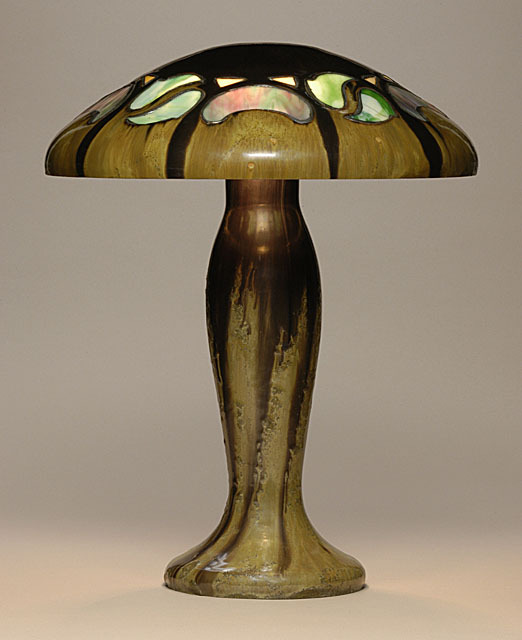 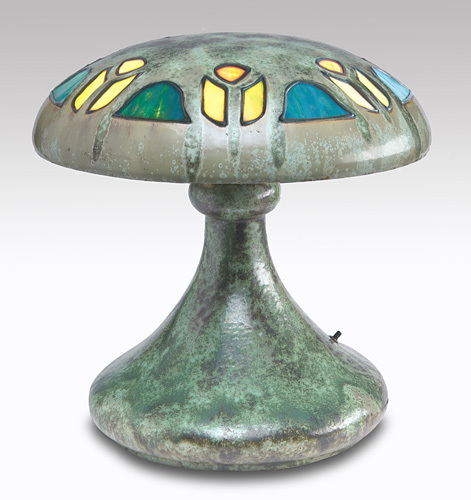 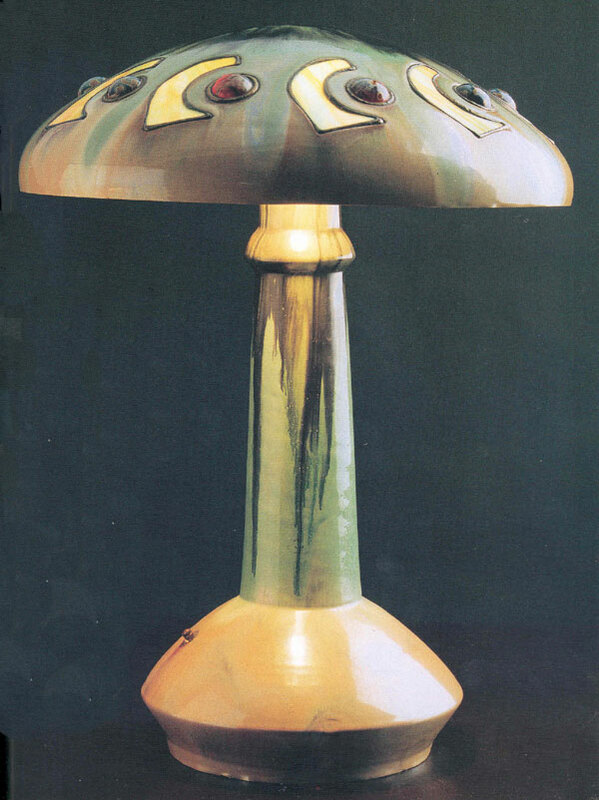 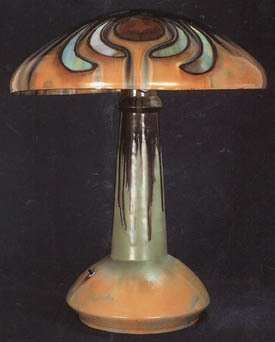 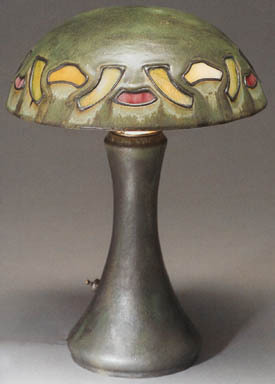 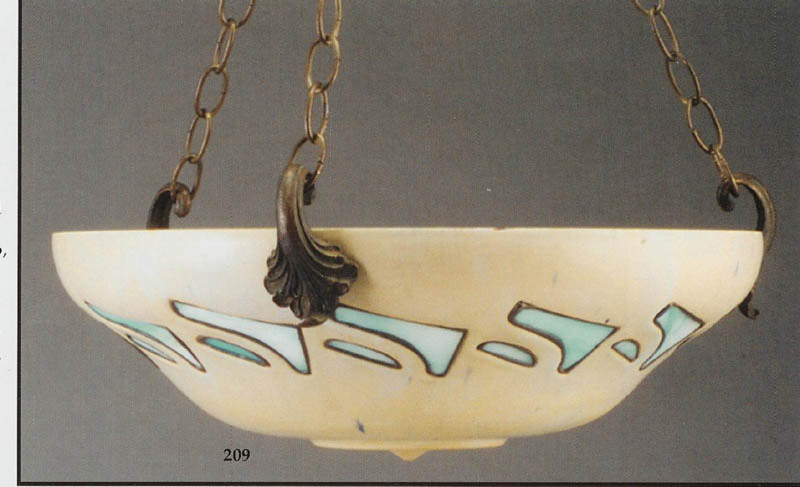 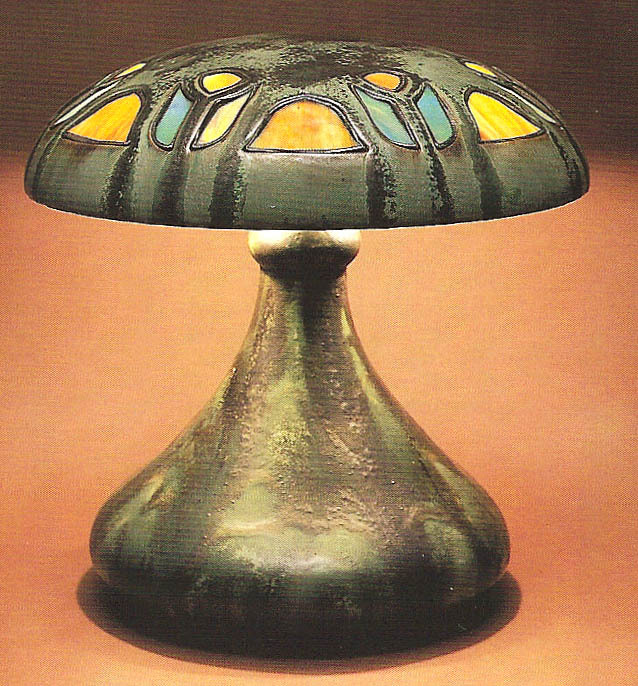 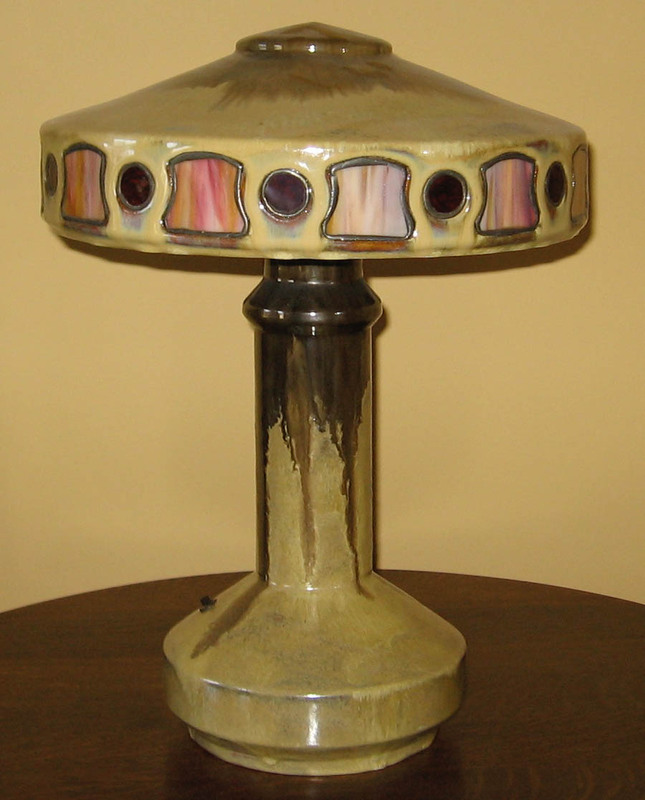 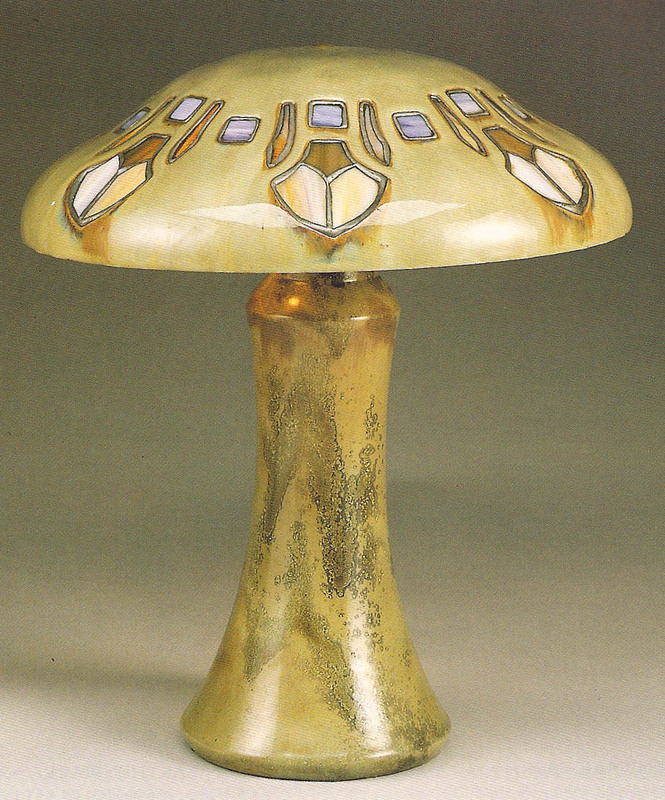 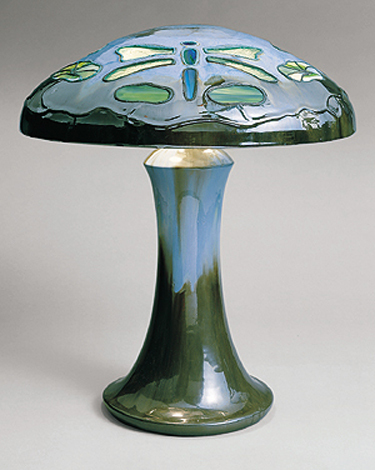 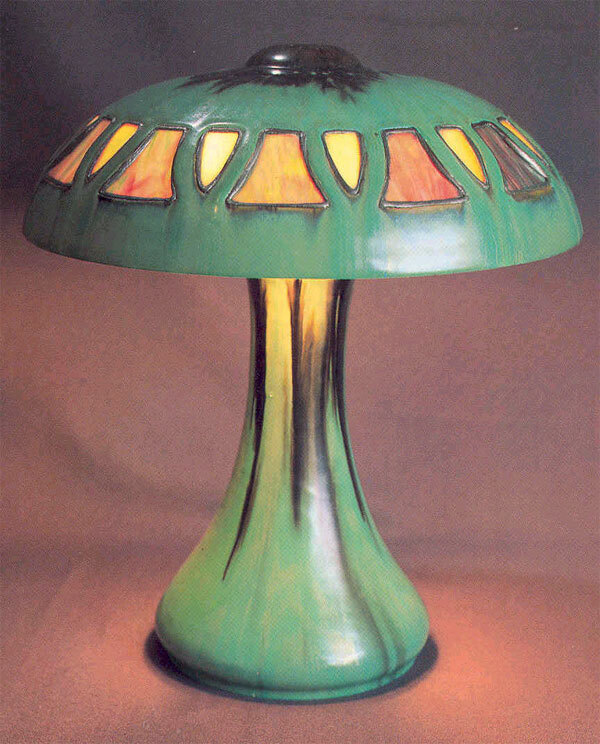 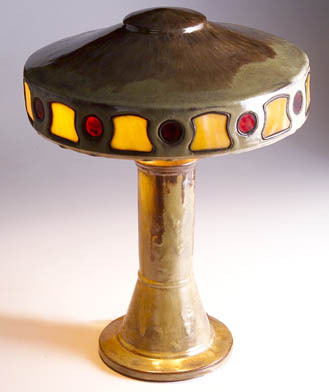 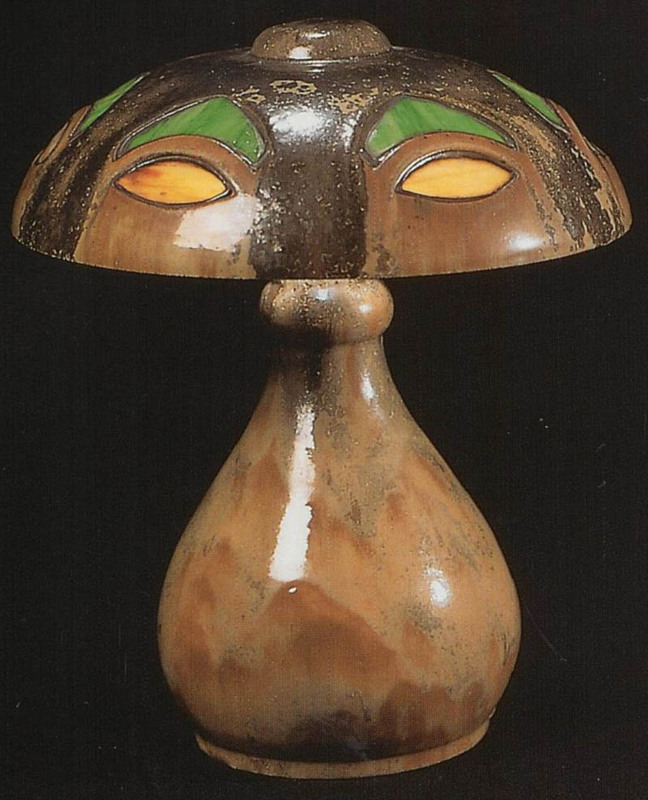 The stunning glazes on VaseKraft lamps were expertly applied to both base and shade, and are arguably Fulper's best work. 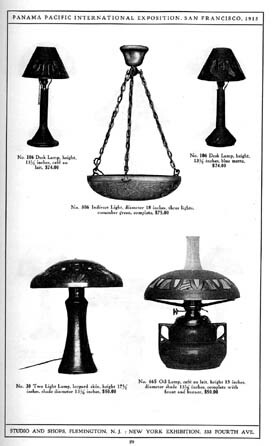 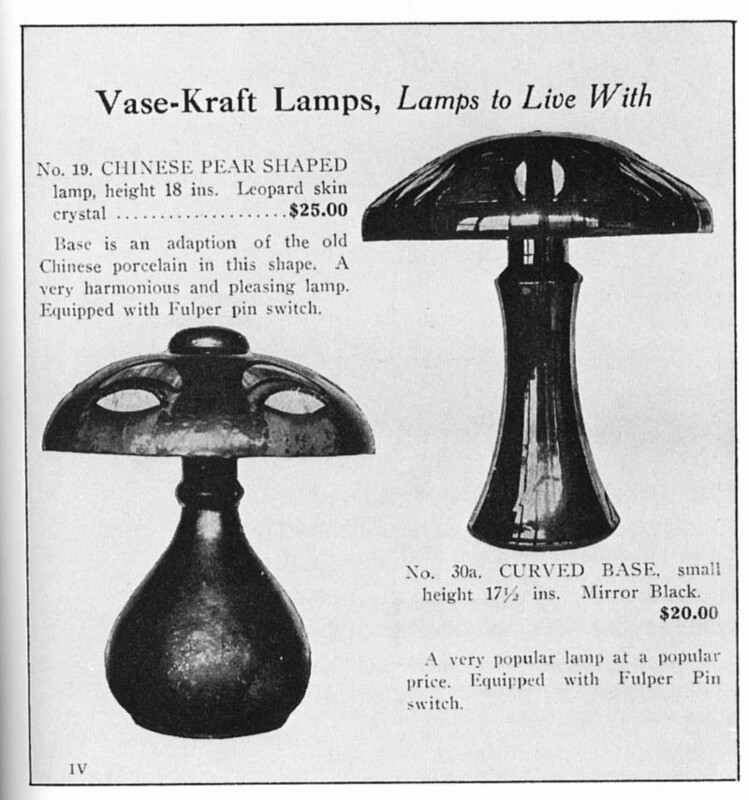 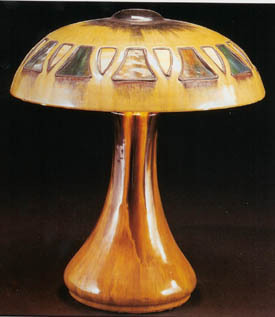 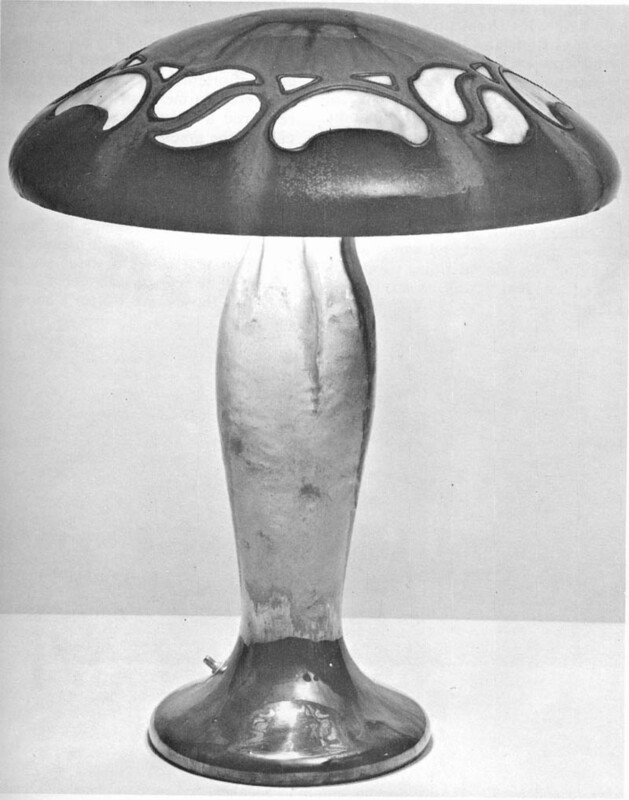 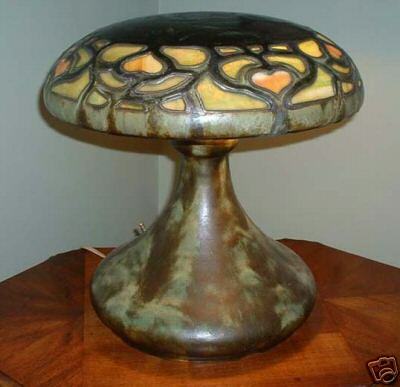 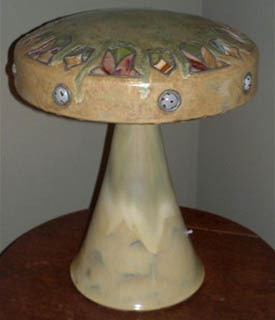 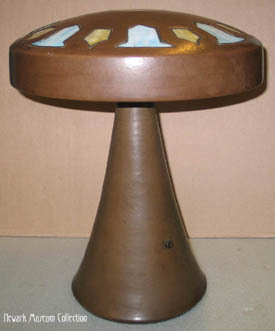 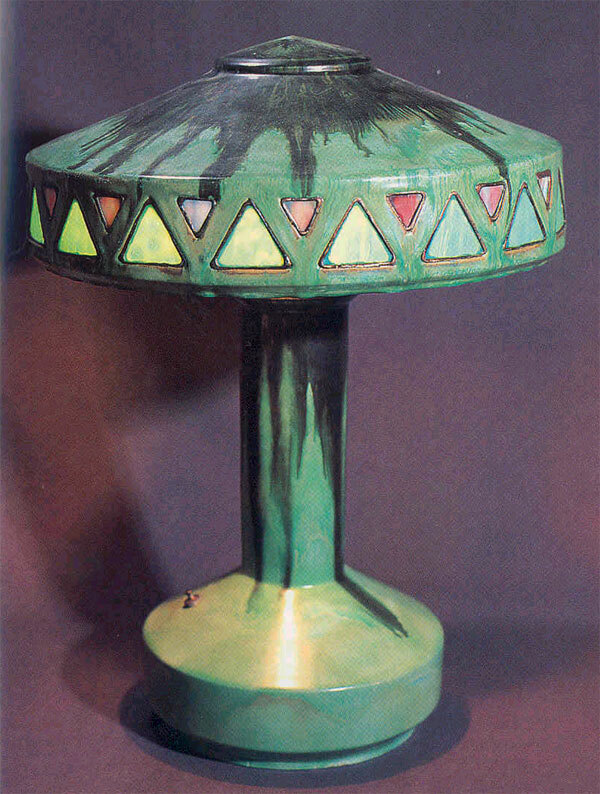 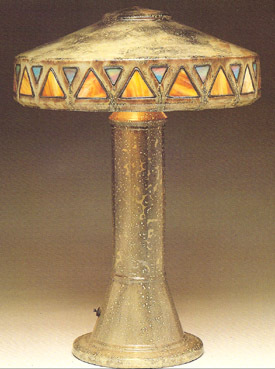 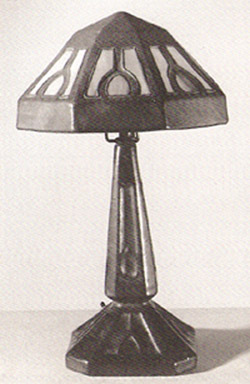 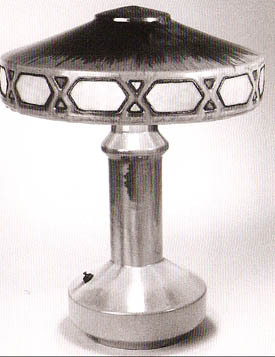 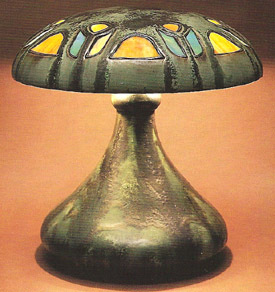 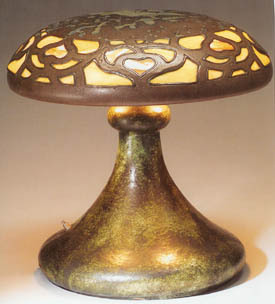 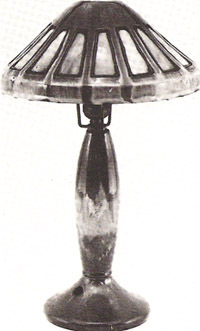 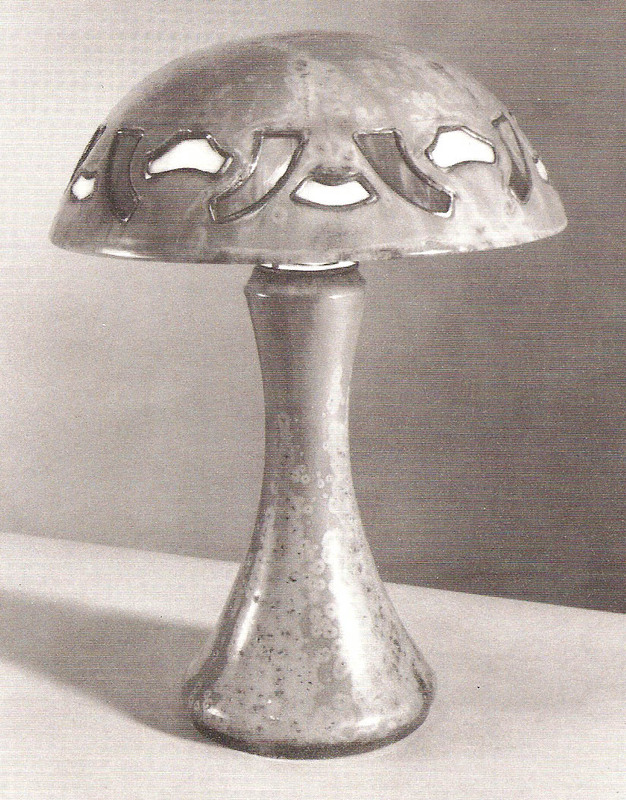 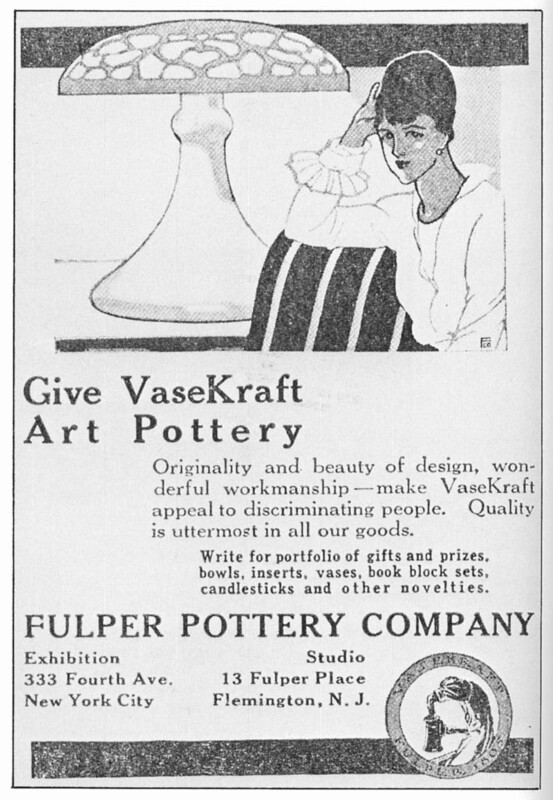 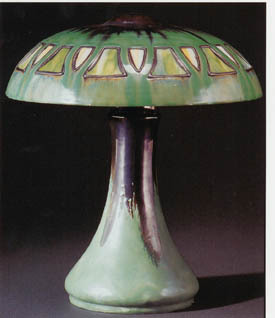 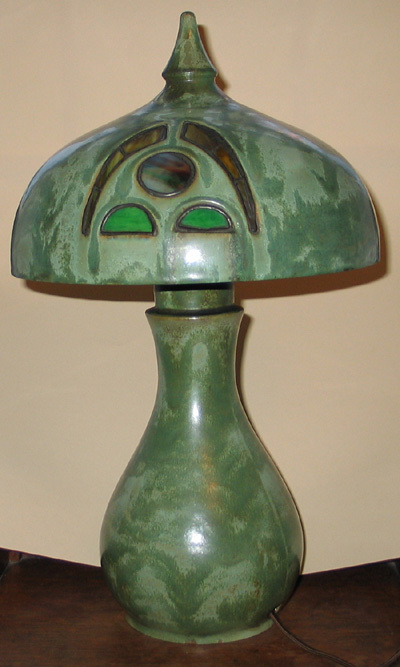 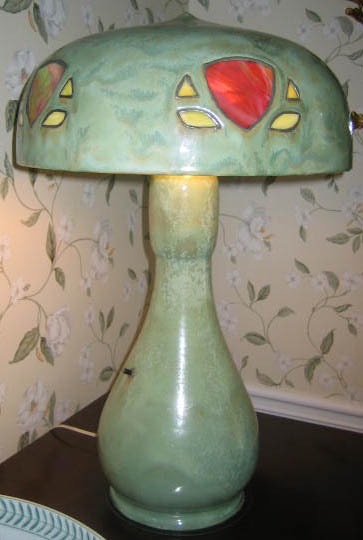 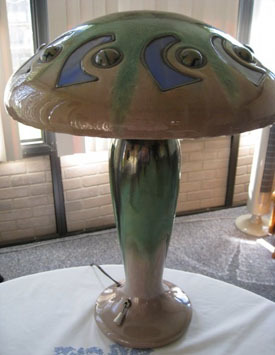 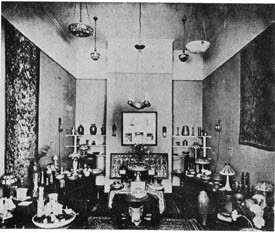 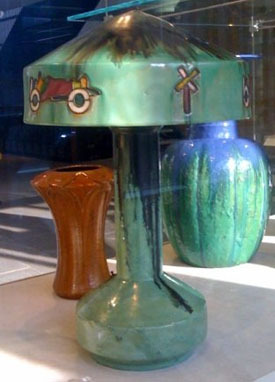 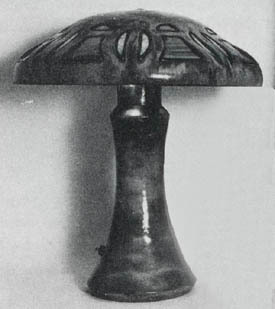 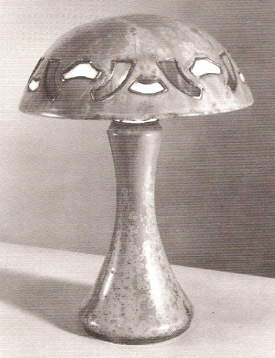 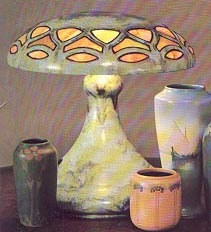 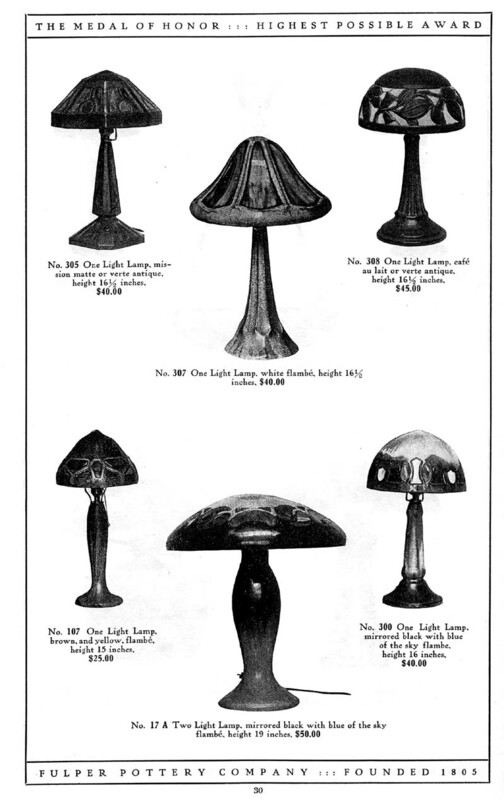 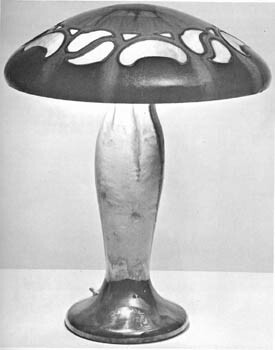 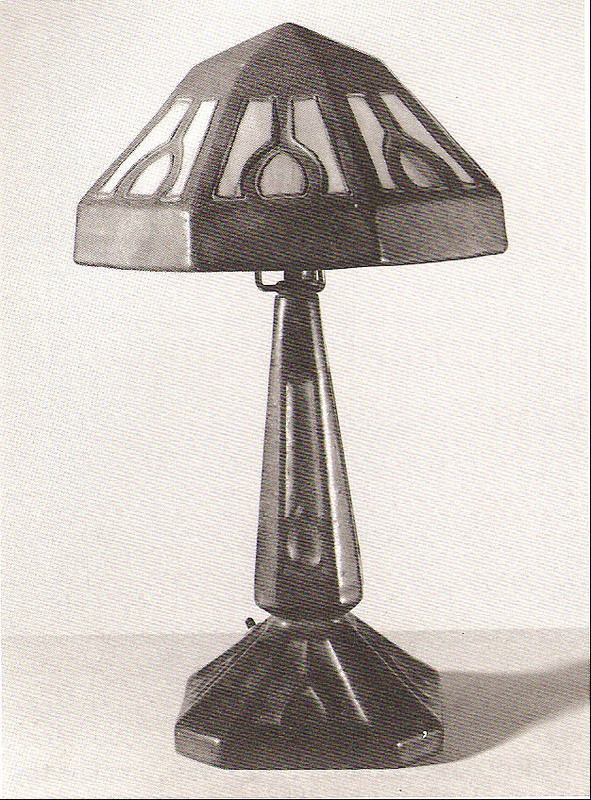 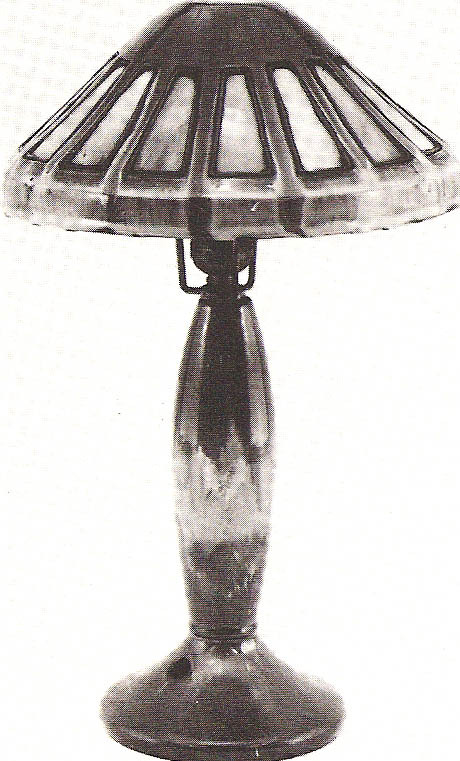 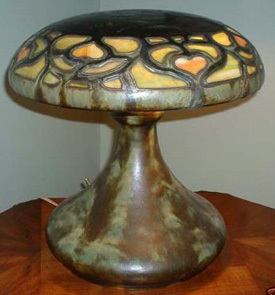 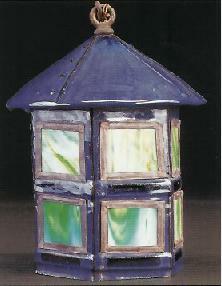 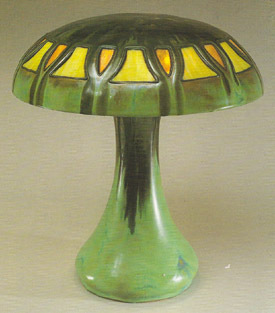 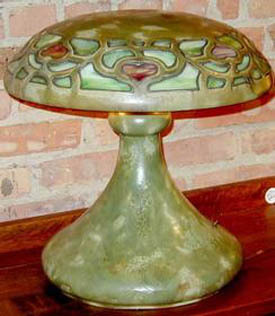 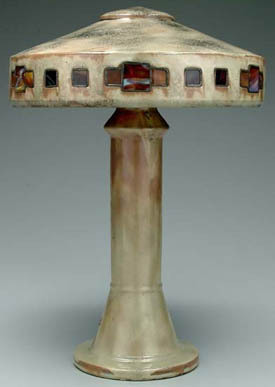 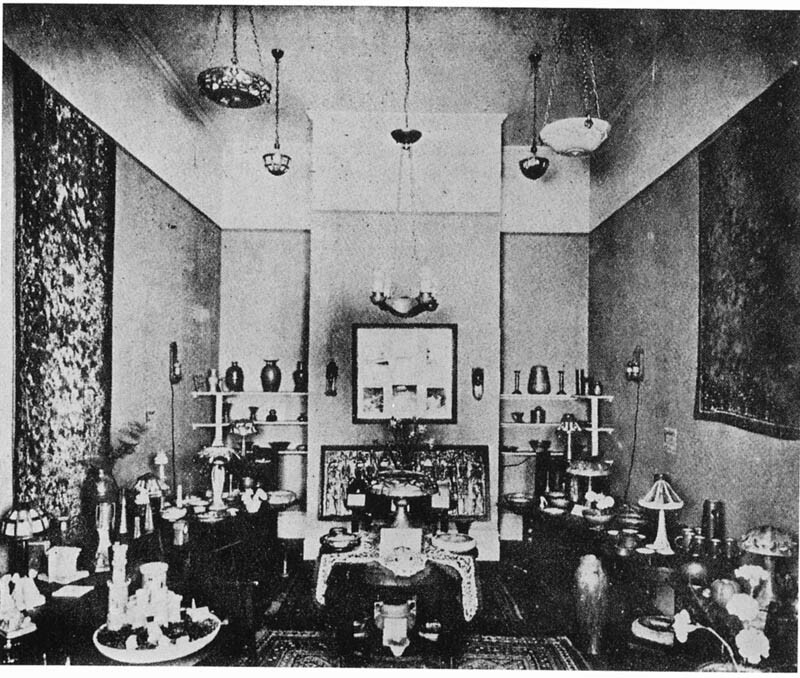 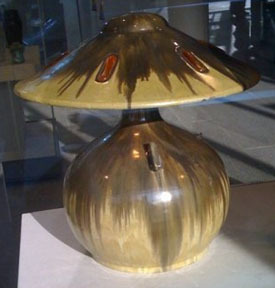 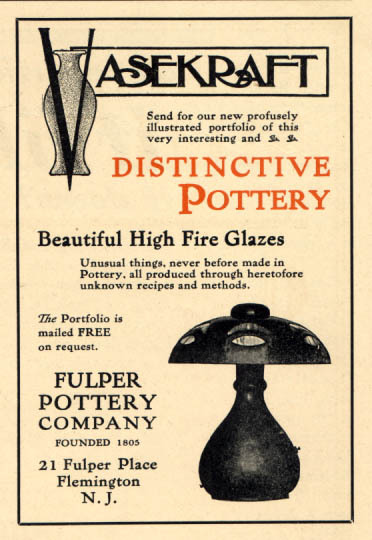 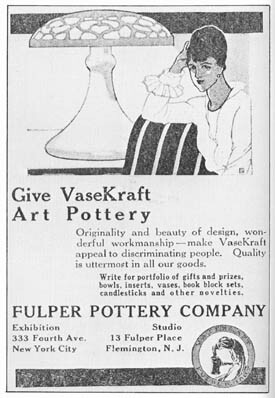 In fact, it has been said that Fulper never put a weak glaze on a VaseKraft lamp, and the pictures below attest to that. 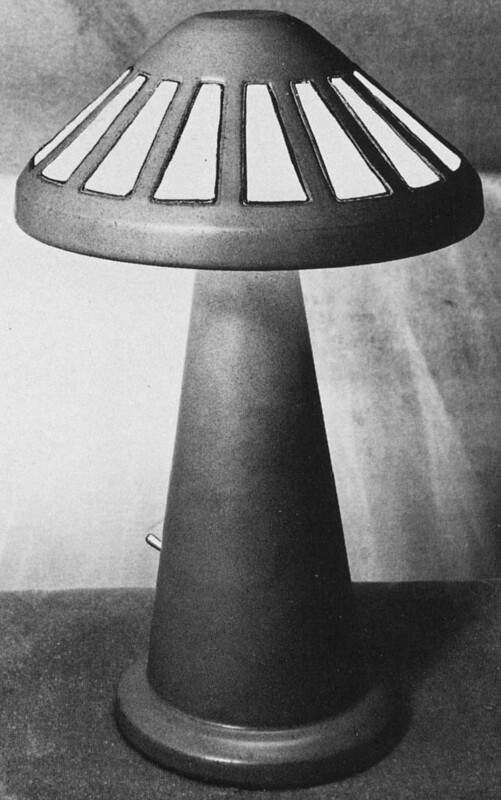 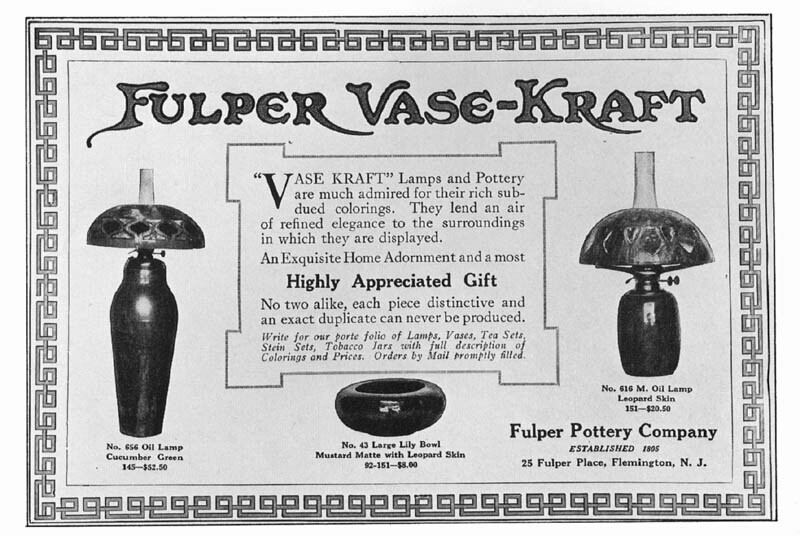 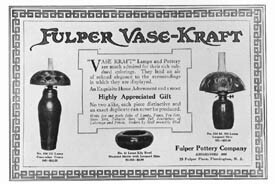 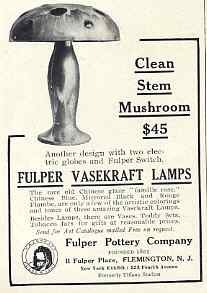 Fulper.net will attempt to include a picture of each known Fulper VaseKraft lamp in this gallery, and in doing so provide a single comprehensive source for viewing, comparing and appreciating the full range of Fulper's VaseKraft lamp production. Photo contributions are highly appreciated! 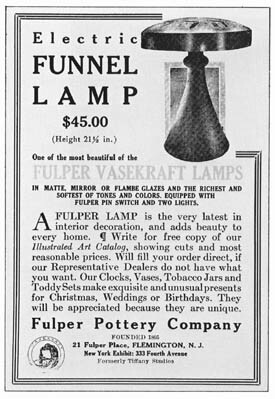 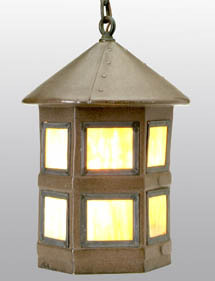 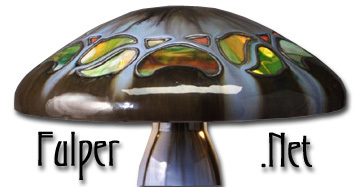 Submission of information about Fulper lamps, or lamp photos, is appreciated -- email vasekraft@comcast.net. 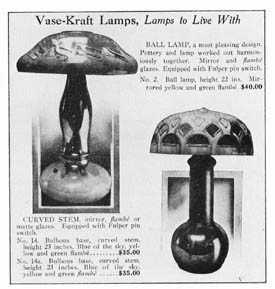 Note -- lamps are arranged by form, and larger pics are available for most lamps and advertisements-- just click on the gallery photos. 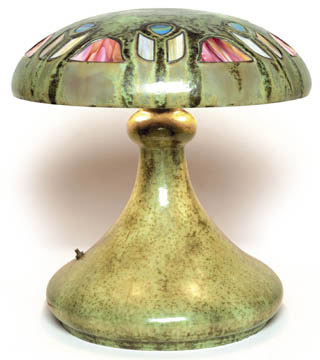 Support the museums and auction houses listed on this page! 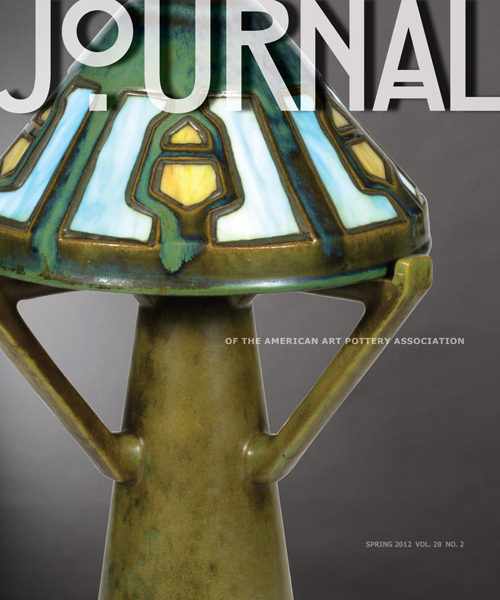 Thanks to the Newark Museum's Decorative Arts Department for allowing us to photograph their wonderful Fulper Funnel Lamp! 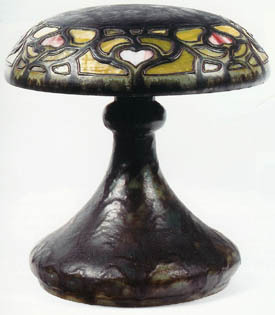 Please visit the Newark Museum and remember to support your local museums!